BLUEPRINT TO BECOMING A MAN - WHY DO WE DO IT? 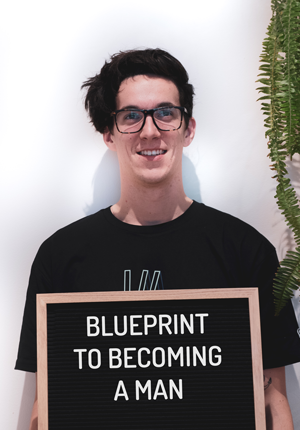 Matt: Can you tell me a little about the Blueprint to Becoming a Man program? Tom: Life Matters has won a grant through Ansvar Insurance to create a program to speak to boys on what it means to become a man, we’ve called it Blueprint to Becoming a Man - Giving boys the tools to become men the world needs. We will journey with boys inviting them to view manhood and masculinity differently. We will delve deeper into what it looks like to be a healthy man, including topics such as gender stereotypes, understanding emotions, finding the words to express ourselves, and respectful relationships. Matt: What’s sparked your involvement in this program? Tom: The thing that always stands out to me are the statistics around mens suicide, and suicide being the number 1 cause of death for Australian men between 14-44. It staggers me! That has stuck out to me so much and has led my passion for wanting to be involved on the ground with this workshop. Our core belief is that everyone’s life matters and I think it’s so relevant to this, we want to do whatever we can to instil this belief and understanding in boys lives. I also work in a church and this is what drives me in that work too, something I’m really passionate about is people understanding their life matters, and that they were created with a purpose already in mind. And I really think this is a culmination of that mission we were given by Jesus, to share this truth. Matt: What are your hopes for the Blueprint to Becoming a Man? Tom: Going big? The hope I have is that we can create a cultural change in Adelaide and beyond. That boys in school start to see themselves as a person that matters and is important to the world, but also they are going to grow into men who will positively impact the world they live in. If you would like to know about the Blueprint to Becoming a Man workshop go to www.lifemattersadl.com.